UNIVERSITY PARK – Robert Windsor had been ready for this game since the spring. A native of Fond Du Lac, Wis., the defensive lineman was waiting all year to play the Badgers, and it certainly reflected in his play on Saturday. Windsor racked up six total tackles on the day, with five of them being solo efforts. The junior also added a career-high in sacks with two, and two tackles for loss on the day. This was Windsor’s most productive game of the season, one that he says was motivated by the prospect of committing to Penn State over Wisconsin, and getting a chance to play against the team from Madison, a city that is just over one hour out from his hometown. Windsor is now 2-0 in his career against the Badgers, something that his coaches and teammates say he, and his family take a lot of pride in. This season has not turned out the way that Wisconsin would have drawn it up. Entering the campaign with a preseason Associated Press ranking of No. 4, there were a lot of expectations placed on the team from Madison. Many analysts figured that the Badgers would get to their third straight Big Ten Championship game, and potentially contend for a berth in the College Football Playoff. However, Wisconsin has not lived up to those expectations. In fact, with a record of 6-4 through 10 games, the Badgers have woefully underperformed so far this season, especially compared to where many thought they would end up. A large part of that is due to their struggles on offense, and Saturday was no different. Wisconsin backup quarterback, Jack Coan, started in place of the injured longtime starter Alex Hornibrook. From the first snap of the game, it was evident that Coan and the Badgers couldn’t do much through the air against Penn State’s stout defense. Coan was intercepted twice, one of which came at the hands of Penn State safety Nick Scott with Wisconsin threatening deep in the hosts territory in the final minute. The Badgers were held to just 60 passing yards as Coan went 9-20 with no touchdowns and a passer rating of under 51. The lone bright spot for the Badgers came from their sophomore running back Jonathan Taylor. For the contest, Taylor finished with 185 rushing yards on 20 carries. However, most of his damage was done on a 71-yard touchdown run on the opening drive of the game. The sophomore still averaged a whopping 9.1 yards per carry, but the Nittany Lions were able to keep him out of the end zone for the remainder of the afternoon. During the game, Taylor did become the 4th Wisconsin player ever to record consecutive 1,500-yard seasons on the ground. He joins Ron Dayne (1998-99), Montee Ball (2011-12) and Melvin Gordon (2013-14) as part of an elite tier of Badgers’ running backs. The loss for Wisconsin was its fourth straight, making it the first time since 2012 that the Badgers have dropped four consecutive games. For freshman kicker Jake Pinegar, Saturday was not just another day at the office. Pinegar attempted a career-high five field goals for the game, and connected on three of them in the swirling 25 mile-per-hour winds that ripped through the late autumn air. Two of those makes came from beyond 40 yards out, including a career-long 49-yard field goal to give the Nittany Lions a 10-7 lead late in the first quarter. After a shaky start to the season, the freshman has lived up to the praise of his coaches and teammates. Pinegar has now converted on nine of his last 11 field goal attempts, and has been an instrumental part of Penn State’s victories over Indiana, Iowa and Wisconsin. Penn State’s honorary captains were Devon Still and his daughter, Leah. The two were shown on the field prior to the coin toss. … Penn State switched its tackles before the game. 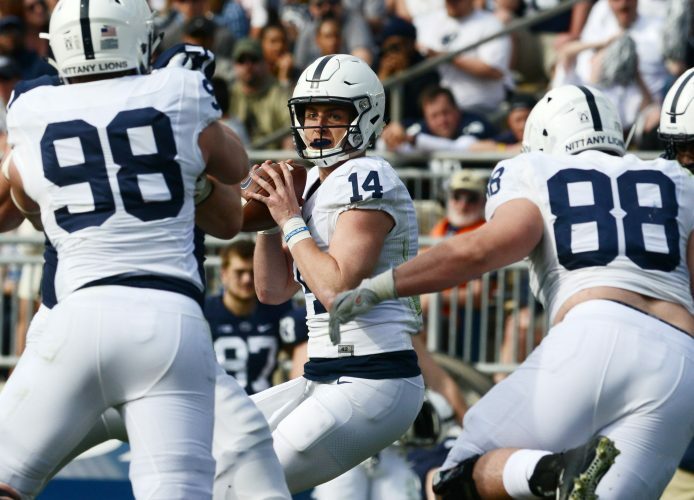 Ryan Bates is at RT while Will Fries takes reps at LT. … Running back Miles Sanders reached 1,000 yards rushing for the season with a 9-yard run midway through the fourth quarter. … It was a tough day getting to Beaver Stadium. I-80 and I-99 were closed for long stretches leading up the game due to accidents. The weather on Saturday morning was problematic for travel. Temperatures were in the low-30s, and it had snowed overnight. … Jonathan Thomas recovered a fumble and converted a fake punt for Penn State late in the third quarter. … Penn State placekicker Rafael Checa did not make the trip to Michigan last week. However, he was on the field today for every kickoff, and thereappeared to be no sign of an injury.